Alumnae, parents, and other visitors can make reservations for the Alumnae Cottage or Barbee House. 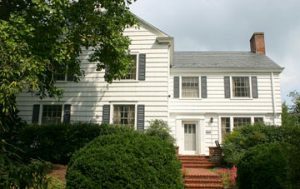 Located on the east side of campus at the base of Faculty Avenue, both houses are comfortable and welcoming places to stay. 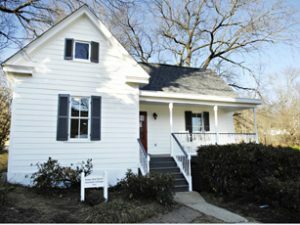 Completely renovated in 2010, the Alumnae Cottage features three guest rooms, each with a private bath. Other amenities include free WiFi access throughout as well as a central living room and full kitchen that serve the entire house. Interior design by Elaine Stephenson ’83. Built in 1936 to house faculty, Barbee House was named for Charles Lewis Cocke’s daughter, Bessie Cocke Barbee. Barbee was completely refurbished and redecorated in 2003, thanks to Wyndham Robertson ’58 and Brooke Morrow ’78. Interior design by Elaine Stephenson ’83. Barbee features four suites and two guest rooms, each with a private bath. Other amenities include free WiFi access throughout as well as a central living room, kitchen (no stove), and half bath that serve the entire house. All rooms are available on a limited basis and are first come, first served. A credit card may be required as a room guarantee and in some cases there is a two-night minimum stay on the weekends. Hollins University is a smoke-free campus; therefore smoking is not permitted in the guest houses. For the health, safety, and enjoyment of all of our guests, pets, with the exception of service dogs are not permitted in the guest houses. Under Title II and Title III of the ADA, a service animal means any dog that is individually trained to do work or perform tasks for the benefit of an individual with a disability, including a physical, sensory, psychiatric, intellectual, or other mental disability. Emotional support animals, comfort animals, and therapy dogs are not service animals under Title II and Title III of the ADA. Other species of animals, whether wild or domestic, trained or untrained, are not considered service animals either. Contact Brittany Wade for reservations and more information.